Touch support detected. How will you be browsing the site? The playlist is empty. Add songs from the media and schedule pages. Use your mousewheel (or finger) over the pictures to scroll through them. Clicking on a picture will show a download link for the original quality picture, as well as photography credits and captions if available. 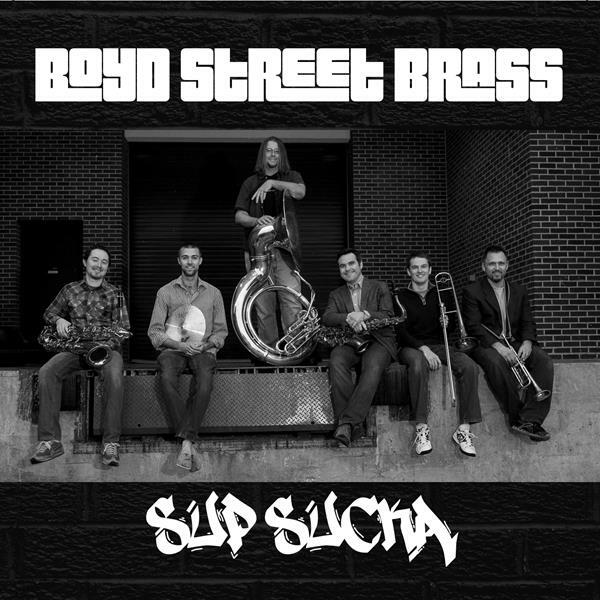 Boyd Street Brass is a 7 piece horn band based in Norman, OK. We formed the group in winter 2013, modeling it after traditional New Orleans street bands. But we have developed a unique and diverse sound, blending funk, swing, Latin, and pop music. In April 2015, we released our debut album Sup Sucka, featuring 14 original songs. We perform a mix of instrumental and vocal tunes featuring Jay Wilkinson, including original songs by Jay as well as covers of other brass bands and popular songs. Keep an eye on the website and follow our Facebook page to stay up to date with our public events. Jay Wilkinson received his BME and MM in trumpet performance from the University of Oklahoma, where he is the director of jazz studies, and is currently a DMA student at the University of North Texas studying trumpet performance and jazz studies. He has worked with multiple Grammy winners and nominees, and has been awarded citations for outstanding performance for both trumpet and piano, as well as being a featured vocalist for the Oklahoma City Philharmonic. Mr. Wilkinson has participated in various jazz festivals as a judge and clinician, as well as the National Trumpet Competition as a judge in both jazz and middle school divisions. Mr. Wilkinson is also a member of the Oklahoma City Philharmonic, University of Oklahoma Brass Quintet, Lyric Theater Orchestra, and the Oklahoma City Jazz Orchestra. 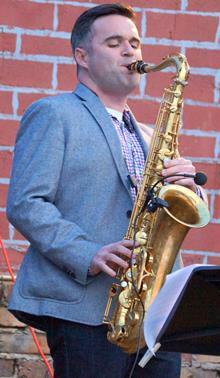 Jonathan Nichol is the Assistant Professor of Saxophone at the University of Oklahoma. He holds both a Doctor of Musical Arts degree (2010) and Master of Music degree (2007) from Michigan State University, and a Bachelor of Music Education degree from Central Michigan University (2005). Nichol's primary teachers have been John Nichol, Joseph Lulloff, Rob Smith, Diego Rivera, and Rodney Whitaker. Jonathan Nichol was a semi-finalist in the 2009 International Concert Artist Guild Competition and a finalist in the 2012 International Concert Artist Guild Competition with h2 quartet. He is a recipient of the prestigious Michigan State University Distinguished Fellowship and is a Presser Scholar. Nichol was the winner of the Central Michigan University Concerto Competition and two-time winner of the Michigan State University Concerto Competition. He has performed Michael Torke's Saxophone Concerto with the Alma Symphony Orchestra and William Bolcom's Concert Suite with the Grand Valley State University Symphonic Wind Ensemble. Jonathan Nichol is a member of the acclaimed h2 quartet, recipients of the prestigious Gold Medal at the 2007 Fischoff National Chamber Music Competition and the First Prize Award at the inaugural North American Saxophone Alliance Chamber Music Competition. h2 Quartet's CD Generations (BGR 185) was released in August 2008 on the Blue Griffin Recordings label. h2's second CD, Times and Spaces (BGR 211) and the Blue Griffin Label received a 2010 Aaron Copland Fund Recording Grant. In March 2012, h2 quartet released its third album, Groove Machine (BG 245), which was named to the 2012 American Record Guide Critics Choice List. Dr. Nichol has also recorded with Billband, a New York based mixed-chamber group dedicated to realizing Grand Valley State University Professor Bill Ryan's compositions. Sparkle, from Billband's album Towards Daybreak (Innova 841) was selected by NPR music as one of the Best 50 Songs of 2013. 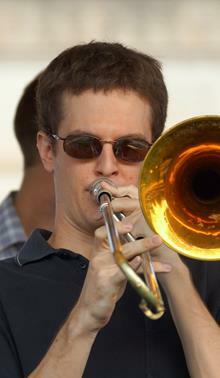 Jonathan Nichol is a Yamaha Performing Artist and a Vandoren Performing Artist. Eric Walschap is an Adjunct Professor of Music at the University of Oklahoma in addition to being the Manager and Coordinator of Facilities and Technology for the School of Music. He holds a Master of Music degree (2014) and a Bachelor of Music degree (2011) from the University of Oklahoma with an additional 131 credit hours towards a Bachelor of Music Education degree. Mr. Walschap serves on the Jazz in June Board of Directors where he is also the Stage Manager, Co-Chair of the Programming Committee, and Consulting Chair of Winter Winds. An active saxophone instructor, he has taught hundreds of students in the central Oklahoma area over 13 years and has been involved in multiple studios. Mr. Walschap was the co-founder of both Infinity Music Arts Academy and Axent Music, and has taught saxophone at the University of Oklahoma, the Norman Music Institute, the Norman Institute for the Performing Arts, Imagine Music and Arts, and McMichael Music. As a performer, he has toured the country several times with multiple groups including performances in Hollywood and Las Vegas. He has recorded nearly a dozen albums and had radio time on both 94.7 The Buzz and NPR with various bands. He has performed at two national saxophone conferences and one international saxophone conference and given lectures on the Electronic Wind Instrument at both festivals and regional conferences. Daryl Nagode graduated in 2011 from the University of Oklahoma, where he studied trombone performance with Dr. Irvin Wagner and performed in jazz groups under the direction of Jay Wilkinson. Shortly after graduating, he became a member of Banana Seat, an established cover band based in Oklahoma City. For more information about upcoming performances, see Banana Seat's facebook page. Daryl also plays bass trombone in the Enid Symphony and performs regularly with St. Lukes United Methodist Church, Westminster Presbyterian Church, Sooner Theatre, Weizenhoffer Theatre, Rose State Theatre, Cimarron Opera, and the OKC Jazz Orchestra. He also works part time as the webmaster for the OU School of Music. Daryl designed and built this website and also mixed Boyd Street's debut album, Sup Sucka. Professor Brian Dobbins began performing professionally in 1996 at Busch Gardens in Williamsburg, VA. He graduated from Virginia Commonwealth University in 1999 with a Bachelors degree in Music Education, and then began performing with the New Mexico Brass Quintet while working on his Masters degree in Music Performance at the University of New Mexico. 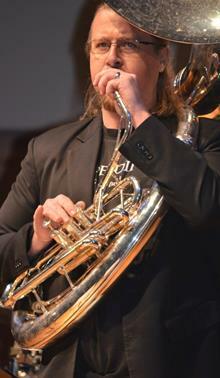 In 2000, he won the principal tuba position with the Santa Fe Symphony where he continues to perform today. After receiving his Masters in the summer of 2002, Mr. Dobbins had the opportunity to spend the summer performing with the Santa Fe Opera. Later that summer he took a one-year position in Xalapa, Veracruz Mexico, where he performed with the Xalapa Symphony Orchestra and taught tuba at the University of Veracruz. The following year Professor Dobbins accepted the Visiting Professor of Tuba and Euphonium position at the University of Oklahoma, and after three years of establishing strong high school and university studios, he accepted the Assistant Professor position at the University of Oklahoma. Brian Dailey began his pursuit of a music career at the University of Oklahoma in 2008. There, he studied percussion with Dr. Lance Drege, Dr. Ricardo Coelho de Souza, and Dr. Nathan Daughtrey. In 2010, Brian won the spot of tenor captain with the Boston Crusaders Drum & Bugle Corps, a world-class organization that competes in the Drum Corps International circuit. As a member of the Boston Crusaders, he spent the summer touring and competing around the country. 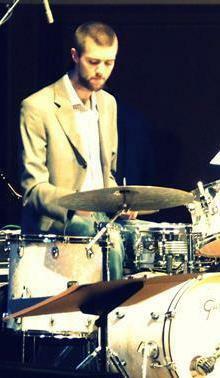 In May of 2012, Brian earned a Bachelor of Music in Percussion Performance degree and won the outstanding percussion undergraduate award that same year. Immediately after graduation, he signed a 6 and a half month contract with Carnival Cruise Lines playing drumset for the showband onboard the Carnival Splendor. Boyd Street's debut album, featuring 14 original songs written by Jay Wilkinson. The album shows off the group's versatility, featuring styles like Zydeco, Funk, Latin, Power Ballads, Swing, and even a hint of Classical. Ryan Sharp joined us on lead trumpet for the album. Christi Wans assisted with production and also played trumpet on the final track. The album was recorded at Studio Seven in Oklahoma City and mixed by Daryl Nagode. You can order a digital copy using the link below ($10). Thank you for supporting us! Our album is available through most online retailers, some of which are linked below. We prefer that you order through CD Baby if possible, as other retailers take a much larger cut. You will need to create an account on their website, but you will get DRM-free files (mp3, mp3-320, or FLAC), and you can use that account to re-download the files at any time. Click on a picture to see download options for that picture, or use the button in the top right of the section to download a .zip file of all group photos. Resolution options will appear when you click the button. Click on a headshot or the biography button below to see download options, or use the button in the top right of the section to download a .zip file of all bios or headshots. Format options will appear when you click the button. Boyd Street can perform for just about any event. We typically perform in larger rooms or outdoors, but we can adapt to just about any situation. We are always looking for opportunities to perform for students. We can give clinics in addition to performing. It is a great opportunity for students to hear a group like this and to learn from experienced players and teachers. If your school is interested in hosting a concert, clinic, or both, please get in touch. There are a lot of factors in price, particularly distance of travel and performance/clinic length. Please contact us if you would like a quote. No upcoming events on the calendar right now. Check back soon. Or better yet, book us! We performed a show at St. Luke's United Methodist Church, Edmond Campus. This show was part of a concert series hosted by St. Luke's at multiple locations. We had a blast collaborating with the Norman Philharmonic for performance at the new outdoor amphitheater at Legacy Park in Norman. We wrapped up most of the recording for our second album at Bell Labs Studio in Norman! We performed for the Deep Deuce Sessions series by OKSessions. A jazz combo featuring several Boyd Street members performed at Urban Johnnie Bar & Grille nearby, and the full Boyd Street Brass played at the LEVEL Stage. We performed at the Artesian Arts Festival in Sulphur. The festival features southeastern Native American artwork from over 90 artists, live music and dancing, food trucks, and more. We did another recording session for our second album at Bell Labs Studio in Norman. We performed at Andrews Park in Norman at the May Fair Arts Festival. May Fair is a non-profit arts festival in Norman, presented by Assistance League Norman. The festival includes food trucks and vendors, original artwork, student art shows, children's art activities, family activities, a 5k race, and live entertainment. We performed for students at Moore High School. We performed from 8-10pm at Saint's Bar & Lounge in OKC. This show was part of the Saint's Sessions series by OKSessions. We performed for the OKC Hobby Lobby creative division's annual Christmas party. We did a tour of performances at Oklahoma Schools, including Highland West Jr. High, Shawnee HS, Owasso HS, Southmoore HS. We performed in the courtyard at Headington College on the OU campus before the OU vs Tulane game. We performed at the faculty convocation for the OU School of Music. We had a blast playing for the Summer Breeze concert series at Lions Park in Norman. This is a free concert series that is open to the public. Summer Breeze is hosted by The Depot in Norman. For more information about the series, check out The Depot's webpage for Summer Breeze. We played for the wedding of one of our own! 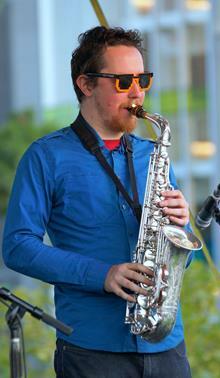 Saxophonist Eric Walschap married the lovely Jennifer Tripi. We started work on our second album at Bell Labs Studio in Norman! We performed at Rivermont Retirement Community's Concert on the Lawn Series. We performed for 2 hours at the Lebanese Heritage and Food Festival at Our Lady of Lebanon Church in Norman. We performed an hour long concert at the Fred Jones Junior Museum of Art as part of their Tuesday Noon concert series. Jay Wilkinson hosted a Christmas jazz recital at OU at Catlett Music Center. We were one of several groups that performed. We gave several performances and clinics for schools in Fort Worth, TX. We performed for the homecoming festivities of the OU Alumni Association. We played a free show at Puebla Tacos y Tequileria on Main Street in Norman. This was a special show, as it featured Eric's proposal! We performed to close out the 5th annual Lebanese Heritage & Food Festival at Our Lady of Lebanon Church. OU hosts a weekly convocation, featuring performances by OU music students and faculty. We were one of the groups who performed at the 2016 fall faculty convocation to kick off the semester. We performed at Shawnee High School for students from Shawnee and Bethel High Schools. We gave a free concert along with brass band Catlett Caravan for national jazz day at Brothers Eatery on campus corner in Norman. It was a blast! Thanks to everyone that came out. We performed a short concert as part of the first annual Jazz Fest. 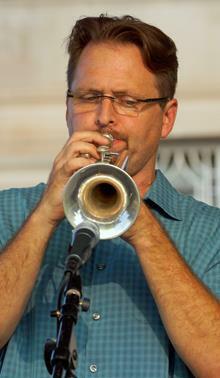 Jazz Fest is a 2-day educational hosted by Jay Wilkinson and the University of Oklahoma. It is a great opportunity for students and directors of jazz ensembles to learn from nationally recognized adjudicators. For more information, check out the jazz fest website. We performed at the Hobby Lobby Christmas party. We featured 7 new arrangements of Christmas tunes, including one Jay wrote just for Hobby Lobby, called 12 Days in the Lobby. We performed for students at Tishomingo High School and Elementary School. We had a blast performing at Micah and Kayla's wedding reception. We performed for an hour at the Civic Center Music Hall Bicentennial Park for 'Jazz on the Lawn'. The performance was part of the 2nd annual OKC Jazz Fest, a new festival featuring jazz performances at several locations in OKC over several days. We performed for an hour at Arts Festival Oklahoma, held at Oklahoma Community College. It is a free 3 day festival with art and live music from open to close. We performed at the annual faculty convocation at the University of Oklahoma. We performed at the Oklahoma Bandmasters Association convention at the Renaissance Hotel in Tulsa. We played for an hour and a half at a picnic following the morning services at Westminster Presbyterian Church in Oklahoma City. Our brass players also performed in the church service that morning! We were one of the groups that performed for the 'Jazz Brunches' at the ASA Hall of Fame stadium in OKC. We performed for a Crawfish and Shrimp Boil at Main Street Bistro in Davis, OK.
We performed at the evening concert of the Great Plains Regional Tuba-Euphonium Conference, held at Oklahoma City University. We performed for students at Southmoore High School. We performed for students at Capps Middle School and Putnam City High School. We performed for students at Kennedy Elementary School in Norman. We performed for students at Westmoore High School. We had our CD release show at Brothers Eatery & Pub in Norman for our debut album, Sup Sucka. Thanks to everyone that came out to support us, we had a blast playing for you all. We performed briefly at the North American Saxophone Alliance Regional Conference beginning at 9:00pm. The conference is hosted at OU by Jonathan Nichol. We went back to Studio 7 in OKC for the final recording session for our first album. We went back to Studio 7 in OKC to continue work on our first album. We performed for the Norman Rotary Christmas Party. We went back to Studio 7 in OKC to continue work on our first album, but we were so funky that the mixer blew up and we had to reschedule! We performed at the Grand Awards Show Finals at McSwain Theatre in Ada, hosted by Jae L. and Crossover. We performed for several classes at Highland Weset Junior High for their career day. We began working on our first album at Studio 7 in OKC. We performed a 30 minute concert inside the Fred Jones Art Museum on the OU campus. We performed a free, hour long concert at Catlett Music Center on the OU campus. OU hosts a weekly convocation featuring performances by OU music students and faculty. We performed at the 2014 fall faculty convocation. We were one of the local artists featured at the annual Jazz in June festival. We performed for an hour to kick off the last night of the festival. We performed at the Santa Fe Depot performing arts studio in Norman. The event was one of several events leading up to jazz in june to promote the event, as well as a part of the Norman Art Walk, which features art exhibits in several locations throughout Norman. Inside the Depot, there was an exhibit by artist Joey Frisillo called "Oklahoma Colors: Earth, Sky, and Water". We performed for band students at Cimarron Middle School. We performed for band students at Edmond Memorial High School. We performed twice for students at Southmoore High School. Boyd Street performed for 3 hours at Brother's Eatery in Norman for an end of the year party. We performed for an hour for students at Blanchard High School. Harrah High School hosted a fundraising jazz festival Friday, April 11. The event featured 3 local high school jazz bands and Boyd Street. 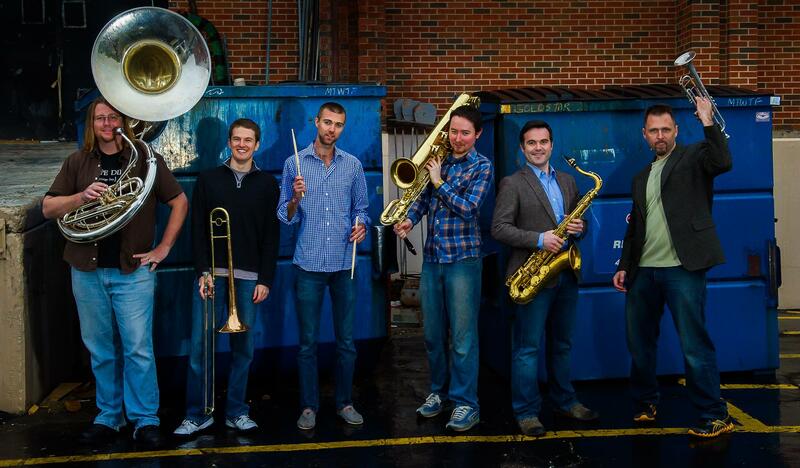 The Singing Sooners and the Boyd Street Brass were featured guests at the OU Jazz Ensembles' Spring Concert. We performed 3 hours for a Mardi Gras celebration at the Hilltop Hideout bar in Noble. Boyd Street Brass led the parade for the annual Mardi Gras fundraising event for Jazz in June. Boyd Street was one of 3 local groups featured at Norman Rocks, a concert series hosted at Catlett featuring Norman based groups. Midlife Crysis and SquadLive also performed later that night. We performed for the OU school of music students at the weekly convocation. We performed 6 numbers to close Eric's masters recital. We had a lot of fun performing and giving clinics for the band programs at Norman High School. Every year, OU hosts an event called "A Day in the Life", which allows prospective students to attend classes in a tour of life as a music major. Boyd Street kicked the event of with a bang. We had a lot of fun traveling around campus performing for tailgaters and people heading to the game. OU hosts a weekly convocation featuring performances by OU music students and faculty. We made our debut performance at the 2013 fall faculty convocation. Having Boyd Street Brass out was incredible today! Thank you guys so much for making the trip to play for and work with our students! Thanks to Boyd Street Brass for putting on the best wedding show a bride and groom could ask for. Kayla and I thought you were fantastic and put on a phenomenal show! This website was built by Boyd Street member Daryl Nagode. If you notice any problems with the site, please let me know! I occasionally do freelance website jobs, but I am currently too busy to take on any additional work. Group photography was done by Michael Anderson. We highly recommend him! Check out his website: performingartsphotos.com.